When we last heard from the Las Vegas based-band The Killers, they were romping around still trying to find their true musical calling. For the last decade, Brandon Flowers and company have been caught in a weird musical rut since they abruptly switched directions from new-wave to Americana when they released their second album, Sam’s Town in 2006. It’s not fair to say that they’ve been a straight up bad group since that time – they have still had a few moments, but for the most part, the band who looked like they were capable of making great albums well into the future had quickly become the band who might have one or two good songs from each album left in them. 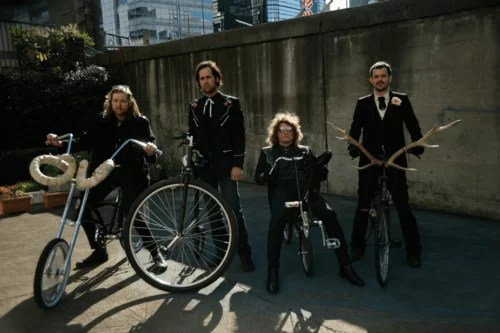 That change was solidified with their truly middling fourth album, 2012’s Battle Born, a set of songs which was supposed to please their new-wave/Americana fan-base who were itching for either another “Mr. Brightside” or “When You Were Young” by somehow splitting the difference and delivering an album that was based in Americana but had some, fleeting new-wave influences on it. It ended up straddling the fine line between being musically tepid and flat-out ostentatious. The Killers during the Sam’s Town era, 2006. So, you’ll understand my frustration, when five years later, here we are wondering if The Killers even have anything truly show-stopping left in the tank. Their new single from their fifth studio album, Wonderful Wonderful (out September 20th) is entitled “The Man,” and it finds the band leaning more towards the straight up pop of Brandon Flowers’ 2015 solo album, The Desired Effect rather than any of the Killers previous studio albums. The synth-driven song doesn’t sound anything like the Americana-Killers of Sam’s Town fame, but rather, (if a comparison were to be made to a Killers record), it leans towards the same sort of vibe of Day and Age, with this track having more of a danceable or 80s club kick instead of utilizing Day and Age’s spacey tones. “The Man” finds Flowers lyrically posturing that he’s “USDA: Certified Lean” and that “you can’t break me down,” while proclaiming in the chorus that “I got news for you baby, you’re looking at the man,” and while that represents a significant departure from any of the lyrical themes that we’ve heard from the Killers at any point till now in that it’s much more direct and macho, it’s not the lyrics that end up casting a shadow over this song for me. Unfortunately, the fact that the whole track is over-baked and seemingly overthought is what truly brings it down, throwing everything possible into the musical sink and seeing if any of it sticks commercially. Music is supposed to be effortless and purposeful – it was that tight, effortless feeling that gave most of the Killers hits their value and yet, nowadays, they are finding new ways to completely overthink nearly every track they touch. Maybe in three months-time, I’ll be writing something completely different; making the argument that the Killers had created an album full of pop gems and were reborn into a new facet of their career. But, if history is any indicator, it’ll be another in a now ominously growing line of disappointments, and that leaves me mourning the loss of a band which at one point looked completely unstoppable, at least for now.